Combination of Cetrimide Agar + MacConkey Agar w/ 0.15% Bile Salts, CV and NaCl recommended for selective isolation of Pseudomonas and differentiation of coliform and other enteric pathogens. Matching up with the ever increasing requirements of the customers, our company is engaged in providing Mannitol Salt Agar Plate. Fully Automatic Production and Laser Print Batch No & Expiry. With QC Certificate. For determination of microorganisms in food and water. Sabouraud Dextrose Broth 500grm make (Sarabhai Merck). 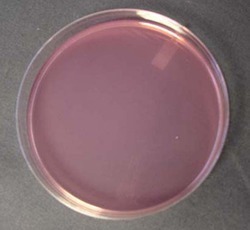 Our company holds immense experience in this domain and is involved in offering wide assortment of Mueller Hinton Agar Plate (Mueller Hinton Agar Prepared Plate).